I'm a few days late posting this card but it's cute enough to still post even if late right? 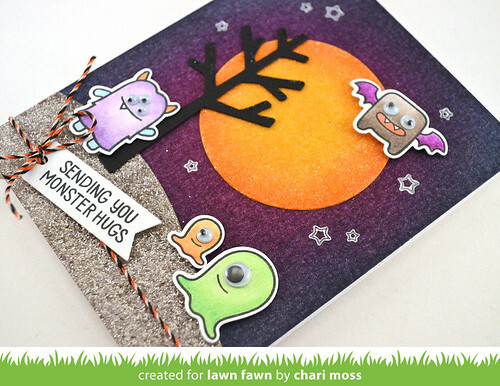 This cad was shared on Tuesday on the Lawn Fawn blog along with a tutorial video. You can check out that post HERE on the Lawn Fawn Blog. I created the spooky sky with seedless preserves and chipped sapphire distress inks. The moon is a die cut circle colored with mustard seed and wild honey distress inks with a layer of glossy accents and a coat of rock candy distress glitter over top. 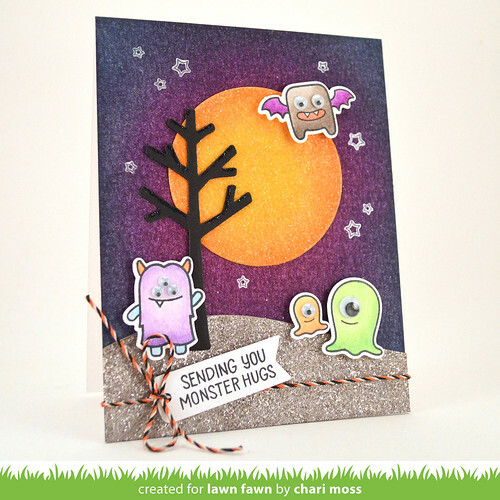 The Monster Mash monsters are colored using colored pencils and gamsol for blending and cut out with the matching dies. I used one of the stitched hillside dies to cut the ground and then covered it with pumice stone distress ink and glitter. The spooky lawn trimmings twine is the perfect finishing touch to hold my sentiment and I just love the fun the googly eyes add to the monsters. You can check out the video HERE on the Lawn Fawn YouTube channel or HERE on the Lawn Fawn blog. Love love love this scene!! It's spooky and so adorable!! Great job distressing the background!